Supplies: White Card Blank 5" X 6 1/2" Halcraft, Papers: Basic Grey-Green at Heart, Stampin Up-Whisper White, Stamps: Lili of the Valley-On Tiptoe, Autumn Leaves Flourishes by: Rhonna Farrer, Stampin Up-Vintage Labels, Ink: Momento-Tuxedo Black, Stampin Up-Kiwi Kiss, Copic Markers, Bic Mark It pens, Darcie Shrink Plastic, silver jewelry cord, sewing machine, pop dots. Wow, you really did a wonderful job---sewing and a plastic charm---love them both! Yes, sewing can be a challenge sometimes---having the bobbin in the RIGHT way is quite helpful! :D Now you know, so you can do it lots & lots on future cards! 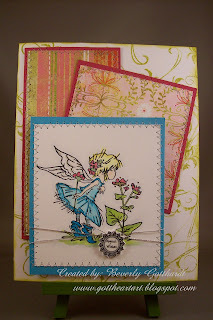 Fabulous card and I'm glad Peggy's sewing tutorial helped! your background papers and flowers really work together to accentuate the red and green. just the perfect amount of blue~ well done! thank you for playing at the pixie cottage. Your charm looks great, must give that a try too. And your sewing is very well done, great work. Your card turned out beautifully. 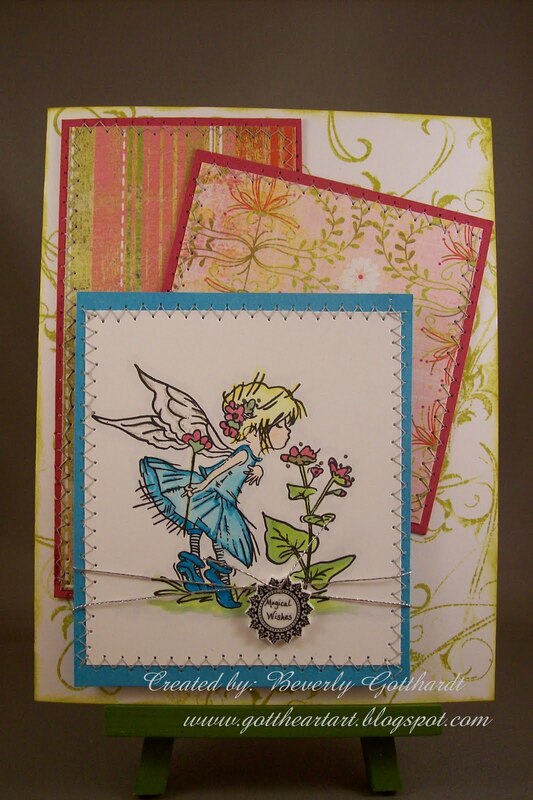 thanks for joining us this week at the Pixie Cottage. Oh my goodness you did a fabulous job on this card! I am so excited to hear that my sewing tutorial helped! Thanks for joining us at the Pixie Cottage! VERY nice, great charm. Thanks for going us at the Pixie Cottage.